When it comes to credit scores, many consumers try to keep their head in the sand. They’re afraid to know the truth, or they think it really doesn’t matter. But it does matter. In this case, what you don’t know can hurt you, and knowledge can become power. Your credit score or scores play a central role in your financial life, and can even affect your personal life. That’s why you should monitor your credit report and scores regularly, and why you should develop good credit habits to keep those scores as high as possible. A bonus to receiving your credit report is the good advice you’ll get regarding ways to raise those scores. 1. Your Scores Will Determine Your Access to credit. Lenders look at those scores to determine their risk in lending to you. Thus, when your scores are high you’ll have an easier time obtaining credit. When they’re low, you may not be able to obtain credit at any price, especially if you need money for a business start-up. If you know you’re going to want credit in the future, get busy raising those scores! With high credit scores, you’ll be offered credit at lower interest rates than those with poor scores. When your scores are low, lenders are taking an increased risk that you’ll default. They want to be well compensated for taking that risk. Think about credit cards, whose interest rates can vary from under 5′% to 25%. In fact, I’ve seen offers made to people with poor credit with rates over 70% – combined with an annual fee reaching upwards of $200. Borrowers with high credit scores generally pay no annual fee. Then think about home mortgage loans, where a difference of 1% on each $100,000 owed amounts to almost $60 per month. If you want to pay the least possible interest on your next purchase, start raising those scores! Low scores make you a high risk and your rental application is apt to be flatly turned down. No landlord wants the risk of tenants who fail to pay rent – or who move out in the middle of the night. Thus, even if you treat your housing well and have always paid your rent on time, low scores could prevent you from living in the location you prefer. 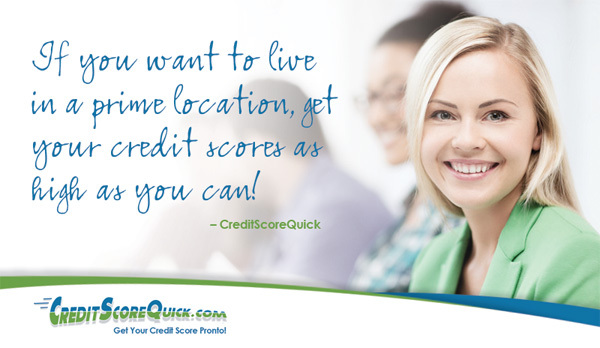 If you want to live in a prime location, get your credit scores as high as you can! Utilities such as electricity, water, gas, phone, and cable TV can’t repossess what they’ve sold you if you fail to pay at the end of the month. Thus, when your credit scores indicate that you’re a high risk, they’ll demand a deposit up front before providing you with service. If you want utility companies to trust you, raise your credit scores! 5. Last but definitely not least – Monitoring your credit report and scores will help you avoid the huge headache of identity theft. Identity theft is always painful, but it is MORE painful when it’s been allowed to continue for months on end. Running regular checks on your credit scores will alert you to a sudden drop, which might indicate fraudulent activity. And when you actually read your credit report, you’ll know instantly if someone has obtained new credit, rented a house, signed up for utilities, or even gotten a new job in your name. Reporting such theft instantly will minimize the damage and the pain. Request your free credit report and scores from creditscorequick.com today. You are currently browsing the archives for the credit rating category.